International activists involved in the Indignado and Occupy movements have begun a campaign to create GlobalNoise, a worldwide cacerolazo, or casserole march, on Saturday, October 13th, 2012. The hope is that local Occupations and Collectives will take up the call to march, using the method of a casserole march to highlight whatever issues are the most important to their community. Historically, banging on a pot has been a universally understood means to gain attention. From children to adults, we all know that a pot or pan can be easily used as a makeshift drum or an alarm. With #globalNOISE, it’s both. The casserole march has its origins as a means to call attention to problems facing the community that the power structure is not addressing, using a method that is hard to ignore. In the past, this form of activism has been used to draw attention to education reform, starvation, government corruption, inequality in resources, and more. It has been revived recently in the international Occupy and Spanish Indignados movements, and most notably by the Student movement in Canada. Since then, it has spread worldwide. It is from these historical references and recent examples that the idea of a coordinated worldwide cacerolazo emerged. An international showing of frustration and unrest on a global scale that would be hard to ignore. A GlobalNoise. The basic idea behind potbanging is simple. Using any cooking spoon or utensil, you hit the bottom of an empty pot, a pan, or some similarly shaped non-glass kitchen equipment. In our experience, metal or wooden cooking spoons make the best drum sticks. The goal of the GlobalNoise initiative is to draw attention to itself, indeed that is the very idea behind a casserole march. And while kitchen equipment may be the first choice, it is most certainly not the only choice. Remember, the goal is to draw attention. If you don’t have access to kitchen equipment, you can use whatever will make noise, even actual instruments, like whistles, horns, vuvuzelas, or even drums. DIY instruments or established noise makers don’t matter, just make noise. You can even encourage drivers to join in with their horns as you pass them on the march. In Spain, they call that “Pitodromo”. As you can see there´s no limit to the imaginative way you choose to make some noise. And if you have any interesting and fun ways in mind, please share it with us. We love suggestions. post on our facebook page, tweet at us (@potbanging), or join the working group! A potbanging demonstration can be any size, from small to big. The bigger the group the louder the noise, but even one person banging on a pot makes a lot of noise. The GlobalNoise working group encourages you to organize Cacerolazo actions in your own city for October 13th 2012. (Due to events already being planned and in progress in various assemblies, some groups and collectives will have GlobalNoise actions over the course of that week. So if the 13th is impossible for your group, try for another day in that week. Remember, potbanging marches are particularly suited for spontaneous participation, especially if the attitude and tone of the march stays festive and positive. Spectators quickly realize that they don’t need anything more than a noise maker to join in. There have been many potbanging-protests worldwide over the last year since the formation of the Ingdinado and Occupy movements. The reason for unrest has ranged from the student debt crisis to the shortage of resources, while the method of expressing the frustration has been the same. There was a large casserole march against inflation in Argentina earlier this year. Reuters reported that “Several thousand Argentines protested against the government… by banging pots and pans in front of the presidential palace in Buenos Aires.” In Seattle, the “noise making” from the Student Debt Noise Brigade takes place once a week. 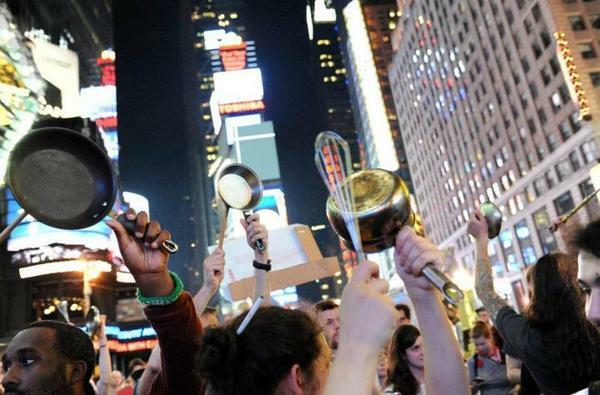 In addition, as reported by Global Montreal, the Montreal casserole marches inspired solidarity demonstrations worldwide. Even back in October 2010 Oldenburg, Germany held the ‘Krach schlagen statt Kohldampf schieben‘ demonstration demanding living wages and fair access to resources. In June of 2012, activists from many different countries, social justice movements, and networks began planning a nonviolent worldwide day of action connected solely by this most noticeable of protest methods, the cacerolazo. The collected activists formed a working group, and the following proposal was created. Each collective or general assembly interested in participating is encouraged to identify what local or regional issues most adversely affect their communities and then join the world in a casserole march. We feel using the power of our collective mass can create a sound of our world population calling out for change that will be hard to ignore. The globalNOISE working group has called for Saturday October 13th to be the day of action where we as flood the streets and towns with the distinctive noise of potbanging. As of late August, members of the Indignado and Occupy movements from many cities, including London, Brussels, Chicago, Madrid, Paris, Hamburg, and Perth, have endorsed this proposal and/or begun planning a globalNOISE casserole action. And the list is growing daily. It’s easy to help make globalNOISE a success. You can simply share the idea of globalNOISE with your family, your friends, on facebook, over twitter, and other social networks. Consider sharing the official facebook page and twitter account, or using the hashtag #globalNOISE. Contact your local general assembly or activist collectives to begin planning creating an event in your area. And be sure to let us know about it! While we may be separated by physical space, we are all united in our struggle. Help us make sure that on October 13th, in every town, in every city, on every continent, the world will hear the sound of change. We will make a globalNOISE! We are beta testing a new iPhone App that allows sharing of anonymous geo-tagged messages with pictures. Nobody likes noise, not even the noise-makers themselves. It reflects how frustrated people are. In other words how frustrating the polished class is to peace-loving people. I can almost hear the noise in the head of such Satanic people. Thanks to the noise-makers. So your the jerk that was making all the noise! Shut up and stop that idiotic music! Where is Rant Casey and Tiousse? I liked the bongo drums. What are you talking about? Why are you back, TechJunkie? Right, they bothered the residents who can afford to live in lower Manhattan while millions of Americans are suffering. Poor things. Wanton disrespect for other people isn't going to win support for OWS. OWS rejects the idea of working to make our government more responsive to our concerns by participating in our democracy and running candidates. The standard response to any criticism of that strategy is that the OWS strategy is to "educate" and "raise awareness" and "change the debate". You are in a straight jacket, techjunkie. Loosen up. Do you think that people are going to loosen up and become receptive to your ideas when they hear you banging on pots and pans outside their windows to intentionally piss them off? It's not intentionally to piss them off. It's intentionally to get them to wake up. The intent is to wake them up but the effect could be to piss them off. LOL! I still like it. It's very innocent, for goodness sake. Get pissed off about some pots and pans, but not about how 1 in 7 are on food stamps, 22% of our kids live in poverty, 49 million have no health insurance, and how the median wage in this country is $26,000 per year, etc. etc.? Come now. LetsGetReal !!!!! People are pissed off that so many are in poverty and without health insurance, etc. That doesn't mean they welcome people banging pots and pans in their neighborhood. It's a bad idea to alienate people from the movement by engaging in actions which annoy them. We need to be annoying the bad guys, not our neighbors. To wake up, identify the source of the noise, and hate you for it? You're going to force people to hear your message that -- what was the message again? It's not very coherent. If somebody shows up outside of my window banging on pots and pans and screaming a message then I would hope that they at least have some coherent message, or else they would just be a pointless nuisance that would make me angry. You are too uptight. Relax. Tech, it's all about "highlighting whatever issues are most important to your community." as it has been from the start, this movement is a white board on which people can write whatever they want. It guarantees competition, confusion, and ultimately, irrelevancy. Definitely agreed about the irrelevancy part. I think that the most important issue within the community of residents in lower Manhattan is going to be the people banging on pots and pans. even the open minded people here don't like to be criticized with reason and logic. We were on strike last year, and cars would go by and honk. many people in appartments near where we were worked nights, and hated the noise, so we went to other block, or were silent if front of the appartment. How about pass out flowers, and hire a mariachi group. might get more people to watch and pay attention. I like mariachi music. I lived in Mexico couple years. They would throw a fiesta, eat some carnitas, tortillas, chiles, frijoles. the pots idea sounds annoying, unless it is tied in to some holiday, maybe Asian new year. I agree. Some sort of pleasant sound would be a much better idea. Singing? instruments? something melodic maybe? People from the 99% there is a foundation that has solutions for us. Please visit, share and discuss. An anti-gravity device? AWESOME. That web site was full-on hilarious. Thank you for the entertainment. gravity is created by the interaction of magnetic fields within the different cores of the planet. No, it isn't. Gravitation is proportional to mass and it has nothing to do with magnetics.